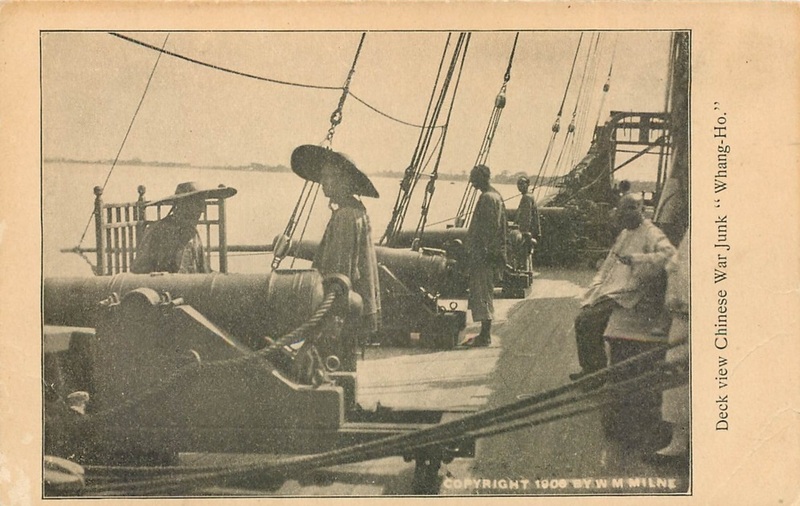 Vintage postcard showing Chinese sailors at the cannons of the War Junk Whang Ho. Note Milne’s copyright on the lower right. Source: Author’s personal collection. We live in a world dominated by maritime travel. The sea lanes that shape the contours of our lives carry so much freight, and do it so smoothly, that we rarely stop to contemplate their existence. Between 90 and 95 percent of all international trade (depending on where you live) crosses the ocean at some point in its production cycle. Sea travel has become an increasingly invisible aspect of the modern world, yet without it almost all of the consumer goods that you are currently surrounded by would simply vanish. This process of global exchange is by no means confined to the material aspects of our existence. Prior to the current age of instant electronic communication, the flow of ideas and images was also shaped by maritime shipping. As new technologies led to the drop of shipping costs in the early 19th century our cultural understanding of the world began to expand. As steam powered ships and trains drove transport costs through the floor later in the later 19th century, global exchange caused once separated societies to collide with increasing frequency and ferocity. This process helped to shape many of the social, economic and political institutions that still dominate our lives. It is also particularly important for students of Chinese martial studies. As we have seen in previous posts in this series, the traditional Chinese martial arts (as we now experience and understand them) were deeply shaped by that country’s economic, social and military encounter with the west. Likewise western perceptions of Chinese society, including the role of violence and practices such as the traditional martial arts, were also shaped by these same economic, political and social forces. Most individuals in the west never directly experienced any aspect of Chinese martial culture. Rather they perceived only those elements of it that were presented to them through the efforts of a handful of authors, journalists, missionaries and entertainers. One might hope that the voices of the more thoughtful journalists and authors (a few of whom produced genuinely interesting reports) would have dominated the conversation in the west. That was not to be case, especially in the closing years of the 19th century and the first decades of the early 20th. The outbreak of the Boxer Rebellion in China, as well a rising social tensions caused by Chinese immigration in the United States, ensured that those narratives did not win the day. Instead the public was fed an unending stream of tales of xenophobic violence against Christians and warnings about the racial and economic threat that Chinese immigrants posed to the citizens of the United States. Much of this anxiety came to focus on the maritime industries. Not only did the Pacific shipping lanes bring unwanted immigrants, but increasingly Chinese crews (always with western officers) were displacing American and Canadian seamen on merchant vessels. While North America was becoming increasingly dependent on this Pacific trade, it remained a source of cultural insecurity. Still, if the dominant narratives of the day were not shaped by the learned professors of Sinology, or even reporters for the National Geographic magazine, who produced them? Specifically, what shaped western perceptions of the nature and role of violence in Chinese society? This is a critical question as it was this era that provided the cultural bedrock that later martial artists in the 1960s and 1970s (individuals such as Ark Yuey Wong, Lau Bun and even Bruce Lee) would be forced to confront as they sought to spread and redefine their combat practices. This post will focus of the critical role of one aspect of the entertainment industry in shaping turn of the century narratives about the nature of violence in Chinese society. Specifically we will look at the role of American businessmen in bringing “War Junks” (complete with elaborate collections of martial arts weapons and blood soaked tales of piracy) to the west coast to act as floating museums and tourist attractions in the first decade of the 20th century. Local newspapers and yellow journalists, all hoping to increase sales with either sensational tales of “daring-do” or exposés of life on the South China Sea, helped to promote these floating amusements making them regionally important attractions. Railroads even advertised these exhibits in an attempt to promote the tourist trade. Lastly, we will even see early Hollywood filmmakers getting in on the act as they used these ships for backdrops in their various projects. It is ironic to note that the ships which are discussed below were in all likelihood important artifacts of southern China’s often contentious maritime world. They had been filled with artifacts and relics that any historian of the Chinese navy or the martial arts would have found to be fascinating. They could have provided a great introduction to the technology of seafaring and trade in southern China, as well as the sometimes violent social world that surrounded it. When they arrived on the West Coast a few years apart, the Whang Ho and the Ningpo were probably two of the oldest wooden sailing ships in the world at that point in time. Yet as Dr. H. K. Van Tilburg has pointed out in his study of these episodes, neither vessel was really allowed to tell its own story. These ships were not ambassadors of Chinese society. Instead they were owned and transported across the pacific by American investors who sought to use to them to tell a very different, and more commercially lucrative, sort of a story. While these vessels had once been actual participants in the complex maritime world of southern China, upon their arrival in the west they were decontextualized so that they reflect back widely held prejudices about the primitive, ahistorical and cruel nature of Chinese society. In many ways the stories of the Junks Whang Ho and Ningpo mirrors the earlier voyage of the Keying. More than 50 years earlier this pioneering ship was bought by a group of financial backers in Hong Kong before being sent to New York City, Boston and ultimately London where it acted as a floating “museum” and amusement for western consumers. Due to the early date of its arrival and association with the 1851 Crystal Palace Exhibition the voyage of the Keying has received a fair amount of attention. It was visited by luminaries such as Charles Dickens and Prince Albert, and it even appears in Queen Victoria’s letters. There are a number of academic works that deal with various aspects of the Keying’s voyage. These events were also critical as the ship’s Chinese crew staged what may have been some of the very earliest martial arts exhibitions in Europe during the year 1851. While they set sail a number of decades of later, the voyages of the Whang Ho and the Ningpo present a number of almost uncanny similarities with the Keying’s earlier efforts. These ships were also bought by western businessmen looking to make a profit by “educating” and amusing the public with a floating museum. They also faced many of the same challenges including typhoons, mutinous crews set on returning to China, problems with American tax officials and ticket revenues that never quite lived up to expectations. Unfortunately there has not been an equal outpouring of academic interest in these later ships. This is not to say that it is all that difficult to find accounts of their voyages. As we will see, newspapers covered these events, their promoters produced various sorts of ephemera (including postcards which are still easy to come by), and local history enthusiasts have been churning out popular articles on the subject up until the present day. Indeed, the arrival of the Ningpo (and to a lesser extent the Whang Ho) has become part of local folklore. This is precisely what makes their portrayal of Chinese martial culture such an important subject, particularly at a time when kung fu was not being taught in North America with much regularity. These popular accounts often include elaborate histories of both ships full of pirates, smugglers, rebels and highly improbably plot twists. On purely historical grounds it is hard to know how much of this is true. Given that the Whang Ho appears to have been an actual War Junk (its date of manufacture can be estimated by certain design elements), we can guess some of the sorts of events that she might have been involved with simply by following the general contours of Southern China’s military history. The Ningpo, a large cargo vessel of a type used to conduct trade in South East Asia, presents researchers with greater challenges. Popular lore states that this ship went from legitimate commerce to piracy, smuggling and slaving in remarkably short order all before being captured by the state. After that it was sold a number of times, but it kept slipping back into its criminal ways, only to be confiscated once again. It is even said that the ship was used as a prison vessel for a time and that a large number of executions happened on its decks. Antony has argued that the line between legitimate trade and piracy in southern China could be a thin as a single famine or a string of bad voyages. Most pirates were merchants and fishermen who had suffered some sort of financial setback. As such it is no great revelation that a ship like the Ningpo might have made excursions on both sides of the law. Still, when ships were confiscated and auctioned by the government they were given new names and registration papers. Thus it is hard to guess how the current owners of the ship in 1905 might have been able to guess so much of its 100+ year history. Dr. Hans Konrad Van Tilburg, the Maritime History Coordinator of the National Oceanic and Atmospheric Administration (NOAA), has carried out an academic investigation of these junks. In 2013 he released a book through the University Press of Florida titled Chinese Junks on the Pacific: Views from a Different Deck. This work provides an extensive discussion of 19th century Chinese Junk construction as well as the crews who manned them. Readers can also see an earlier version of this research in Van Tilburg’s doctoral dissertation, submitted at the University of Hawaii in 2002. I have drawn extensively on his historical reconstruction of the voyages of these ships (which in turn depend on both period press accounts and other records) in the following discussion. Following this historical review we will look at some specific examples of the sorts of discussions of violence within Chinese society that these ships inspired in the press. While these vessels were fully stocked with rather specialized martial arts weapons (including tiger forks, hudiedao (butterfly swords), numerous spears, swords, shields and even pudao) the martial arts as a cultural practice were never discussed. Rather than being seen as one element of a complex set of social institutions, these weapons were instead taken as proof of the fundamentally violent, sadistic and treacherous nature of Chinese individuals. “Chinese boxing” (as western individuals at the time universally referred to the martial arts) was not a value-laden technology that one learned, but was instead an innate expression of the “national temperament.” What need could there possibly be to teach the martial arts if these practices were viewed as being basically innate? This essay then concludes with a few thoughts on what the voyage of these two ships suggests about the image and very slow spread of the Chinese martial arts in North America prior to WWII. 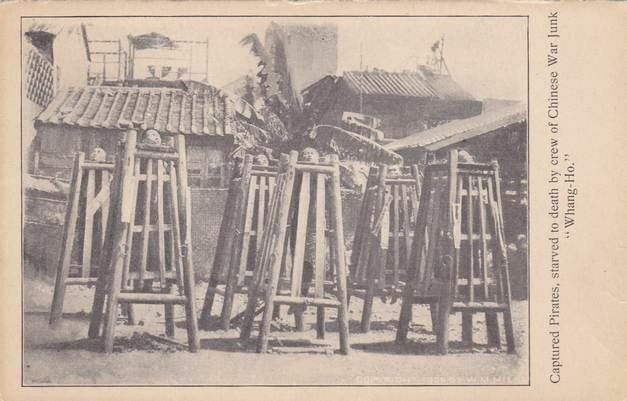 The Armory of the Whang Ho as seen on an early 20th century postcard. Note the Hudiedao in the rack on the back wall. Source: Author’s personal collection. The story of both of our ships starts with an American businessman by the name of William Mckenzie Milne. He was born in New York on August 20, 1866 and died on December 16, 1944 in Los Angeles. Milne is said to have been employed for a time by Henry E. Huntington of Los Angeles. Best remembered as a railroad magnate and the founder of Los Angeles’ trolley car system, Huntington was a noted collector of art and rare books. Milne himself had numerous connections with the entertainment industry, which often promoted events and attractions in conjunction with the local railroads. I have yet to see a good explanation of why Milne was in China at the start of our story. But it was there that he found the Whang Ho, possibly in Shanghai. Milne always maintained that the Whang Ho was a vintage war junk which he bought from the Chinese officials. Not everyone in the US was convinced by his story. Certain newspaper accounts (“Wang Ho Arrives Bearing Cargo of Shudders,” San Francisco Call, Vol. 101, No. 10, 10 December 1906) claimed that Milne’s account of events, much like his ship, was a fabrication. 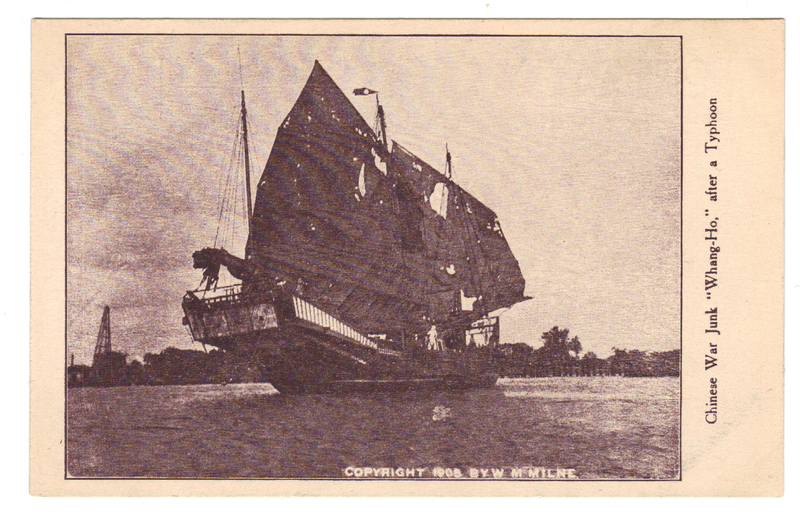 They contended that Milne had not simply had the ship outfitted as a floating museum (bearing mostly weapons and torture devices) in Shanghai as he claimed, but rather that it was actually a replica that he had constructed from the keel up. Nor was skepticism Milne’s only problem. While someone may have been willing to sell him a ship, the Chinese government still retained the embargo on exporting vessels which had complicated the Keying’s voyage to the United States some years earlier. Whether an antique or a replica bearing cannons, the government of China was not keen on the idea of Milne exporting a War Junk to unknown waters for private purposes. American officials were equally non-pulsed by the scheme. Ships from foreign countries were free to visit US ports, but if Milne had simply bought a vessel in China he was liable for a duty of no less than 40% of the value of the ship when it arrived in America. Nor was the California public all that enthusiastic to receive a junk in the first place given the growing hostilities towards Chinese immigrants in the early 20th century. In actuality there was nothing to fear on the immigration front. When the ship arrived on the West Coast it was found that much of the crew was actually Norwegian. The same newspaper article referenced above actually suggests that Milne was forced to hire “Highbinder” from San Pedro’s Chinatown to make good on his promise of a genuine Chinese crew. Unfortunately the one he ended up with tended to get seasick at inopportune moments. After a stint in San Pedro the ship was towed north to San Francisco and then on to Portland where she stayed for at least one year. Unfortunately the venture was never a financial success. The ship received good local press coverage, and Milne sold tickets to tour the vessel in various ports. 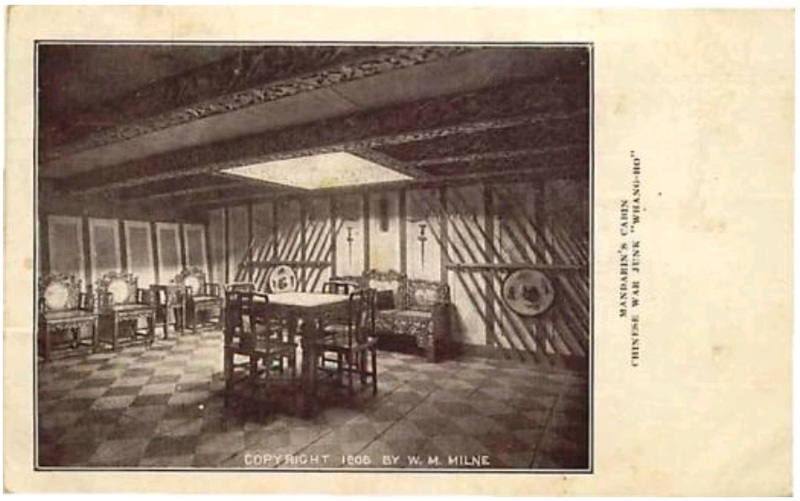 He even converted the vessel’s “front salon” into a gift shop which sold various items including a number of very interesting postcards which all bear his name as the copyright holder. Many of these photographs emphasized the ships martial nature and include images of a collection of spears, shields, cannons and even an entire rack of nearly identical butterfly swords. After disappointment in the northwest, the decision was made to sail the ship to Coney Island in New York via the Straits of Magellan. From there on the venture quickly became a fiasco. The captain abandoned ship in a small boat just as the Whang Ho was leaving the port of San Francisco on the first leg of its journey. He was later arrested on embezzlement charges brought by the ship’s financial backers. The situation on the vessel became much worse during its second oceanic crossing. The ships rudder was damaged as it approached Cape Horn and the vessel was forced to turn back to Tahiti to make repairs. At that point the entire crew deserted and returned to the United States aboard a passing steamer. Eventually a new captain and crew were found and the ship set out after making the necessary repairs. Unfortunately its luck had not improved. The Whang Ho failed to make its scheduled arrivals at a number of ports. Eventually the seriously damaged vessel was spotted by a British cutter and towed to Thursday Island. After that the ship made its way to Sydney in 1908, where it once again made a splash in local shipping circles. Unfortunately the Whang Ho disappears from the historical record after that, its ultimate fate unknown. While Milne’s financial ambitions may have been frustrated, as a businessman he proved to be nothing if not persistent. In 1911 the Ningpo, a large 400 ton merchant Junk, was captured by anti-government forces in Hankow. The ship was sold to a group of American investors for approximately $50,000 dollars. Milne then went about outfitting the ship and hiring a German captain and mixed Scandinavian and Chinese crew to transport the ship to the west coast in time for the 1915 Panama-California Exposition to be held in San Francisco. Apparently it was believed that the crowds generated by this event would make the venture a success where the Whang Ho had failed. Once again I am forced to wonder the degree to which Milne was simply borrowing a page from the Keying’s playbook. The Ningpo left Chinese waters on December 12th 1912 and arrived in San Pedro on February 19th, 1913. While the voyage had been made in a relatively fast 58, the trip had taken its toll on the ship’s aging hull. Promotional material distributed by Milne claimed that the ship had been built was in the final years of the 18th century and that it had enjoyed a long and exceedingly colorful career. While the particulars of its piratical history are impossible to confirm, Van Tilburg points out that British customs officials in China had encountered a number of similar junks that they estimated to be truly ancient, some of them up to 150 years old. This is a remarkable testimony to the construction of these crafts, and it suggests that while we may never be able to separate the history of the Ningpo from the folklore that surrounds it, it may truly have been one of the oldest seaworthy wooden vessels in the world when it made its trans-Pacific crossing. After leaving San Pedro the Ningpo (and its highly developed advertising presence) moved along the coast to Venice and then San Diego, where tickets were sold to the public for 25 cents a visit. For reasons that remain unclear to me she never completed her intended voyage to San Francisco. She instead embarked on a career as a floating museum of Chinese arms, torture and violence (all centering on the subject of piracy) between Los Angeles, Long Beach (where it enjoyed a particularly good run) and San Diego. Regional newspapers from this period ran regular advertisements advising sight seers that they could reach the attraction via Huntington’s Pacific Electric Railway trollies. One suspects that the rail company may have actually paid for much of this advertisement in a bid to increase ridership to its various entertainment destinations. Still, at 25 cents a ticket Milne was unable to make a profit. Facing financial difficulties he once again decided to try his luck on the east coast, before moving on to Europe in the footsteps of the Keying. Fate would again thwart these plans. On November 18th 1913, the anchor line of the Ningpo snapped and she was driven onto the rocks. Milne and the first mate managed to save a number of relics from the ship, and it was eventually floated by a salvage crew. From there it was taken to Long Beach for extensive repairs. Eventually the time and neglect took their toll on the old ship. When she began to take on water the new owner, William Wrigley, decided that the cost of repairing her was simply not worth the investment. She was towed to Cat Harbor on the far side of the Island and allowed to sink onto the muddy bottom. For years boaters came to old hulk to scavenge exotic woods, as did the local Boy Scouts who made regular (and highly destructive) trips to the Junk’s final resting place. Then in 1935 a replica of a fireship (being used in the production of another film) broke free from its lines and drifted into the remains of the Ningpo, burning everything above the water line. 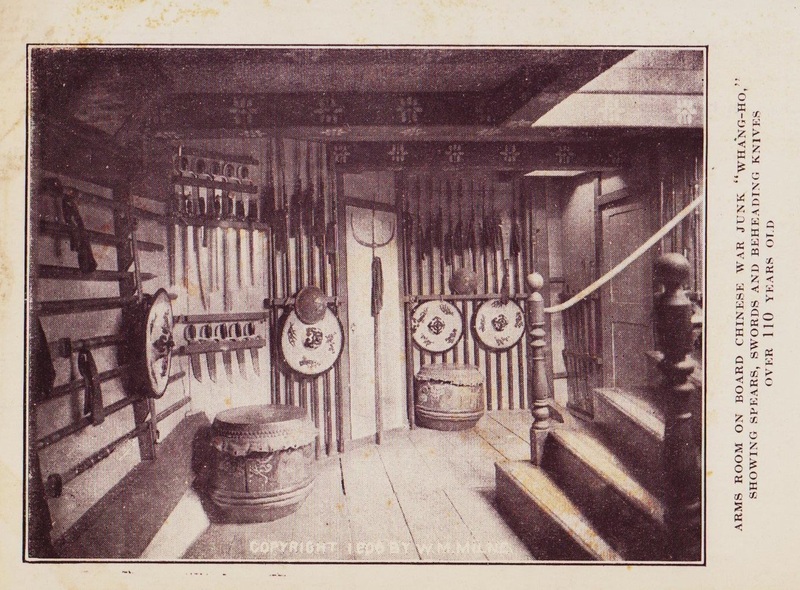 Another postcard of the Whang Ho displaying antique furniture and weapons. Source: Author’s Personal Collection. The ultimate destruction of the Whang Ho and Ningpo was not the end of these ships’ cultural influence. The various bits of ephemera generated by the ships continued to circulate, and the Ningpo became a staple in local folklore. The Catalina Island Museum still has an exhibit and collection dedicated to her time there. A number of essays have been written about the histories of these ships. For the most part they continue to pass on Milne’s marketing stories, each borrowing from the accounts that came before it. Consider for instance Della Phillips’ article “A Peaceful Pirate,” in volume 19 of the Overland Monthly (1917, pp. 327-31). One of the earliest popular sources (outside of the newspapers) to discuss the Ningpo, this article set the tone of much of what was to come, and subsequent authors seem to have drawn on it quite liberally. I have included a few excerpts from this piece that focus on the Junk’s association with violence on the South China Sea. ENTERING the bay of San Diego, California, during the first year of the Panama-California Exposition, the first object to catch the eye was the queer old hulk of a vessel at anchor there. Every sight-seer inquired about it, and gazed with renewed interest when informed that it was the historic old Chinese junk, “Ning Po,” famous smuggler from the Yellow Sea, and the oldest ship in the world still able to do service. This old reprobate of a ship has a history of a kind that can hardly be surpassed by any other vessel in the world. Over a century and a half of smuggling, piracy, slave-traffic, fighting, mutiny, murder and riot make up her record. Her uneven decks and huge camphor wood ribs have been crimsoned with the blood of some of the most desperate outlaws of the Orient as well as with that of their helpless victims. During her long and varied career, almost enough blood to float her has been shed upon her decks. She was built in 1753 in Fu Chau, and modeled after the Chinese idea of a sea monster. The open bow represents the mouth, bulging portholes the eyes, masts and sails the fins, and the high, fantastically carved stern the tail. A dragon contorts his scaly length on each side of the stern. It is easy to be deceived concerning the age of old furniture and Oriental rugs, but this old ship speaks for herself. Odor of camphor wood and the spicy fragrance of beams which, when scraped a very little, yield a spicy aroma of nutmeg, are mute testimony of a bygone era of shipbuilding. One has only to step aboard this ancient vessel to realize that she has all the antiquity she claims. Her one hundred sixty-two years of service bespeak themselves in her rude staunchness of construction, and in the indestructibility of the material of which she was made. There is an air of integrity about the old ship in spite of her villainous record; for she was worthily built, not for smuggling and piracy, but for peaceful commerce. If one can keep this fact in mind, the Chinese characters over the cabin door signifying “Peace and Contentment,” do not seem quite so ironical. 1796. Engaged in rebellion against the emperor. 1806. Seized for smuggling and piracy. 1814. Captured and set on fire at Nanking. 1823. Seized for smuggling silk and opium. 1834. Confiscated by British under Napier for smuggling and for carrying slave girls to Canton. 1841 (cir.). Captured by Chinese government and used seven years as a prison ship for pirates and smugglers. 1861. Seized by rebels in Taiping and converted into a transport because of her size and speed. Retaken by “Chinese” Gordon, in command of the imperial forces against the Taiping rebels. Gordon changed her name to Ning-Po, after the city of that name. 1861. Wrecked in a typhoon. 1911. Captured by rebels in the battle of Hankow. 1912. Sailed from Shankhai, June 6th. 1912. Wrecked in typhoon, June 12th, and again September 26th of the same year, off Kyushi. 1913. Arrived at San Pedro, February 19th. Such a history naturally raises the question: How could the old junk hold together so long, and during so many vicissitudes? When one is once aboard her such wonderment ceases. Back of the officers’ quarters and mandarin’s cabin is the old smuggler’s chamber of horrors. In this dungeon dark compartment there was originally only one very small entrance, and the compartment itself a deep well of darkness extending clean to the hold. Finding it impractical to show visitors such a ventless, rayless place, the exhibitors of the ship sawed a large section out of the thick wall, and put floorings across the deep chasm. Even then the way amidst the thick blackness of the gruesome chamber cannot be found without the aid of a lantern. By means of its feeble rays one may perceive on its outer wall the marks of the shelves that once had been there shelves where the prisoners were placed until they either divulged the secret of their wealth or treasure to the outlaws who had captured them or died of starvation and lack of air in that horrible place. They were literally laid on the shelf, with the prospect of dropping to the depths below if they became restless in their narrow beds. After looking at this place, beheading knives did not appear so forbidding to me. In fact, it was something of a relief to think that the blades were keen and the headsman sure in his stroke. It was his profession, handed down from father to son; and the fact that he lost his own head if he failed to sever his victim’s at the first stroke, made him marvelously accurate. The boys to whom this honored (in China) business is to descend, practice on turnips to acquire skill. A face is marked on the turnip. It is grasped by the tail; and the knife descends in an endeavor to cleave it through in just the right place. One of the villainous looking cutlasses in this exhibit has a history of its own, bearing the name of Kang-how, a noted pirate who carved his way to fame with this blade. A shield made of rattan, and iron cane whose great resilience was calculated to turn the thrust of even these murderous weapons, and a long iron spear for picking up severed heads, also graced this collection. From the misty, dim interior of the old ship, redolent of the smell of camphorwood, we at last emerged on the upper deck that was warm and bright in the California sunshine; on the day we visited her; and here too are many things of interest. Just forward of the mainmast, a weazened, rusty little gun draws the attention. This kind of gun was being made thirty-six hundred years ago so old is civilization in China; and this particular specimen was actually disintegrating with age. The little thing is barely three feet long, offering an almost comical contrast to the big guns on one of the warships anchored a short distance away. Yet, in all probability, this gun, estimated to be four hundred years old, did much execution in its day. It was on this deck that the one hundred fifty-eight prisoners whom the Chinese government found too expensive to feed, were beheaded some time during the seven years the Ning-Po was used as a government prison ship for smugglers and pirates. Another postcard sold on the Whang Ho. This image of prisoner’s being held in death cages has been reproduced on numerous postcards through the decades. It popularity seems to speak to western perceptions about Chinese society. Source: Author’s personal collection. Old-Time Pirate Chaser With Gory Record Will Be on Exhibition at Long Beach and San Pedro. The first Chinese junk, a Man of war, that has ever entered American waters is due to arrive at San Pedro between June 12 and 15, and will be exhibited there at Long Beach for several weeks. It was secured for exhibition purposes only after repeated efforts on the part of the Milne company, importers of Japanese and Chinese curios. The Chinese officials positively refused to allow the vessel to leave oriental waters. By a clever ruse, however, the ship was stolen away in the darkness of night and was far from shore before the officials knew that it was gone and it was too late for them to interfere. The Junk is crossing the Pacific under its own sails, which are three in number and made of grass matting. The exact time for the arrival at the port of San Pedro cannot be determined, as the favorable and unfavorable winds must be reckoned with. The ship is called the Huang Ho and was originally used as a pirate chaser off the southern coast of China. When a pirate vessel was reported to be cruising in the Chinese waters this man of war was sent out with the orders to bring in a specified number of pirate heads. A large basket, woven of grass, was carried in which to put the pirates’ heads. If a pirate vessel was overtaken the leader’s head must come off. It is said, however, that if no pirates were found a fishing smack was seized and the occupants’ heads taken to make up the number that were ordered to be brought back in the basket. On this account the ship has quite a reputation, for it never returned from a chase without the tale of a capture and the heads to substantiate the story. When the vessel returned to the port from which it sailed the high court held a session. This was to determine if the crew had done their duty. The decision was always that the owners of the heads must have been guilty or they would not have been beheaded, and the crew was given great praise. Old-fashioned cannons are carried upon the ship which were used to destroy the pirate ships. In the stern is what is considered the most important part of a Chinese vessel, and that is the joss house, where the crew daily worshipped. The ship is being handled during the voyage across the Pacific by a Chinese crew and the exhibition given in American waters will be a good production of the times when the vessel was used to destroy pirate ships. The Pacific Electric is co-operating with the Milne company to exhibit the vessel. Special rates will be made for excursions to the beaches where the ship will be moored. A model of the ship and several pictures of it are now in the offices of J. McMillan, superintendent of transportation of the Pacific Electric. These will be placed in the windows on the lower floors. 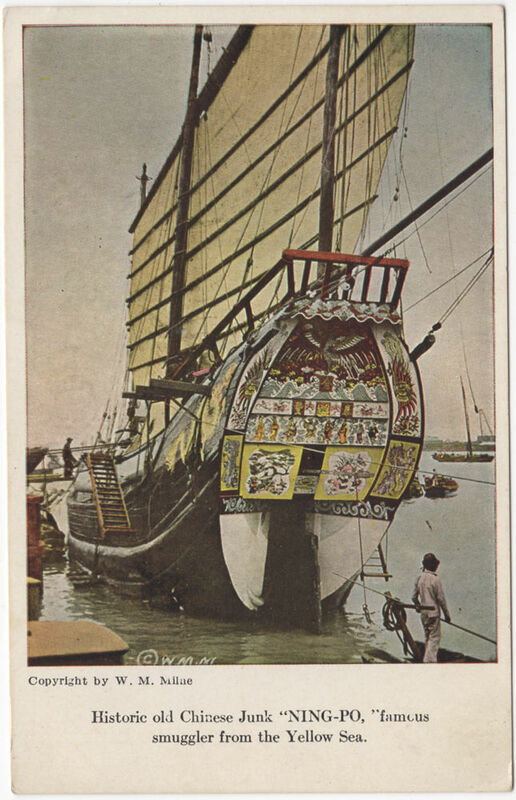 A vintage postcard showing the painted stern of the Junk Ningpo. Source: Author’s personal collection. Certainly these were ghost ships, but what was the ultimate origin of the fears that haunted them? Much of the information in the preceding excerpts is simply factually unreliable. The Whang Ho was not the first Junk to sail off the coast of California. As Van Tilburg has pointed out there was actually a local industry dedicated to turning out traditional Junks that were used by Chinese fishermen up and down the west coast. Nor is it really the case that Chinese soldiers were drilled in swordsmanship from childhood by attacking anthropomorphized turnips. Other “facts” in these accounts are true in the abstract, but how they actually pertain to these vessels is not clear. It is certainly true that the Chinese government starved and beheaded many thousands of pirates throughout the early years of the 19th century. They even displayed the heads in baskets placed in public places much as the article implied. One must be careful about apologizing too much for the Chinese state during this period. As Robert Antony pointed out in his study of the southern Chinese piracy crisis, the government employed a brutal campaign of terror to try and suppress both bandit and pirate activity in the early 19th century. Public starvation and heads in baskets were not an exaggeration. Still, these modes of punishment and execution were inherently political acts. They were meant to signify the legitimacy of the state and celebrate its ability to bring social order. They were not intended as a glorification of violence, let alone as an expression of some sort of universal “national character.” Indeed, they derived their symbolic value from the fact that such acts were far from the norm of daily life. The misgivings of certain newspaper writers notwithstanding, both of these vessels were legitimate artifacts of a violent period in southern China’s social history. I personally think that it is highly unlikely that Milne would have been able to commission the building of a war ship using 100 year old designs without drawing unwelcome attention. On a political level this would have raised too many questions, and on a technical level it may not have even been possible. The sorts of ships that were being built in China in 1905 were pretty different from what was being produced in 1805. Likewise, given her great age, and the nature of piracy in southern China, it is entirely likely that the Ningpo may have been involved in excessively colorful events at some points in her long career. The ships themselves appear to have been undeniably authentic. Even the secondary displays that they carried were very interesting. The weapons on the Whang Ho were probably bought in Shanghai when the ship was being outfitted for its voyage across the Pacific in 1905. Still, we know from historic records that pikes and hudiedao were standard issue weapons on all sorts of ships from that period. The weapons on the Ningpo present us with additional problems. Almost all accounts of visits to the vessel mention its great “beheading sword” and “chopping block” where unfortunate captives met their fate. On the one hand, it is true that many pirates were executed by beheading. Yet Chinese methods of carrying out this sentence never employed “chopping blocks.” This appears to be a clear case of forging artifacts to present images of supposed Chinese barbarism that the public could more readily identify with. Given the Ningpo’s long tour of service as a floating attraction it is not at all clear where all of its weapons came from. The first set was procured in China, much as was done with the Whang Ho. Nevertheless, after the ships near sinking and subsequent sale to the meteor boat company, its store of relics had to be restocked before it could be once again opened to the public. So what sort of items were displayed then? Dr. Van Tilburg was kind enough to show me some pictures that he took of weapons and artifacts from the Ningpo while working with the collection at the Catalina Island Museum. The images show a number of authentic weapons including two tiger forks, a very well preserved rattan shield, a pudao (horse knife), and a period sword that looks like a very long handled version of dadao (probably what the tourists identified as the executioner’s sword). This is a very interesting selection of weapons. All of them appear to be legitimate antiques, yet they are not the sorts of things (pikes, duandao and shields) that one would normally associate with ships. Instead one suspects that they were shipped either from China or possibly were purchased from the Chinese-American community in California when it became necessary to reopen the ship. Van Tilburg notes that the tragedy of these ships is that they were decontextualized and interpreted in such a way that they had little chance to tell their own story. His research interest lay with the technical aspects of ship building. These vessels were fascinating as they were some of the last remaining 19th century wooden Junks of their class. They proved to be well designed, easy handling and fast ships that stood up to a lot of abuse well into their old age. The performance of these vessels was a credit to the individuals who designed, built and maintained them. Yet the public never saw any of that. Being unfamiliar with any sort of wooden sailing ship they didn’t have much of a framework to judge what they saw. Rather than long-lasting feats of nautical engineering they saw only what was exotic and strange. The ships were consistently described as being crude and roughhewn. Any virtuosity that they presented was attributed to the exotic materials that they were made from, rather than the skill of the shipwrights. The crowd tended to focus on “primitive” aspects of the vessels, such as their shrines, elaborately painted sterns or resemblance to “sea monsters.” Van Tilburg concludes that rather than simply misjudging the technical achievements that these ships represented, the public failed to recognize them as a form of “technology” at all. Rather than seeing them as ships that were built in a specific time to do specialized tasks, they were simply assumed to represent a vast and unchanging tradition. Accounts of these displays seem to suggest that Chinese ships evolved in an almost organic sense, through a superstition driven process of trial and error, before even that ossified into “tradition.” There was simply no discussion of the possibility that these vessels were the result of purposeful design. Rather than becoming educated about a specific period of Chinese history (one marked by rapid technological evolution), the western public used these ships to reinforce their longstanding belief that China was ahistorical and unchanging. It seems that these same basic conclusions also hold true when we look at how the western public responded to the portrayal of social violence on these vessels. The late 19th and early 20th century saw massive changes on this front as well. The military was undergoing rapid modernization, civilian martial arts traditions were finding new ways of interfacing with society. Even piracy was changing (and generally declining) during these decades. Yet once again the western public turned to these ships to reinforce their preexisting orientalist notions. Chinese martial culture did not “evolve,” nor was there any reason for it to be taught (aside from the mock execution of turnips). Instead the displays of weapon and law enforcement technology were taken as proof of the essentially vicious and unchanging nature of the Chinese national character. In some respects the voyages of the Whang Ho and Ningpo represent a step back from the earlier efforts of the Keying. That venture had begun was at least the pretense of being an actual educational voyage. Further, the presence of a Chinese crew allowed them to present various aspects of their martial culture on their own terms. It is true that not everyone was impressed with the practicality of their sword and spear dances. For many individuals the combination of Chinese music, theatrical performance and exotic martial traditions was probably mystifying. Yet very few individuals could have walked away from these displays convinced of the essentially violent nature of Chinese society. Charles Dickens left the Keying with many misconceptions about the nature of China firmly in place, but that was not one of them. The decontextualized artifacts of the later ships were intended to have a very different effect on visitors. A beheading sword, chopping block and trophy basket can only be interpreted in so many ways. Within the context of late 19th century fears about Chinese immigrants, few of them would be positive. Individuals often wonder about the late introduction of the Chinese martial arts to North America. By the time the Whang Ho first set sale Japanese Jujitsu was already being taught in the White House and with no less of a sponsor than an enthusiastic Teddy Roosevelt. The Chinese martial arts, by contrast, would not gain much of a presence (even with California’s Chinatowns) until the 1950s, and there would be no real sustained growth of interest in them until the 1960s. Nor can we attribute this to simple ignorance. From the time of the “Boxer Rebellion” onward Americans were very much aware of the fact that these Chinese had their own distinct combat traditions. An examination of the discourse on violence and culture promoted by Milne’s ships helps to explain at least one set of variables that slowed the spread of these fighting systems. Japan was viewed as a strong state that had “learned the lessons” of western modernization. Clearly its martial arts remained linked to essentialist ideals of nationhood. For westerners they were always mysterious and “other.” Yet they also represented an identity that was worth investigating. The perception of the Chinese nation, and its relationship with violence, was not nearly so favorable. After half a century of yellow peril novels and journalism, the public interpreted the artifacts of Chinese martial culture quite differently. Here there could be no common ground. The values of Chinese martial culture were assumed to be implacably hostile. [link] These practices viewed as ahistorical and primordial expressions of Chinese identity. The swords carried by these ships were no more seen as evidence of the existence of complex martial practices than the vessels themselves were accepted as evidence of Chinese engineering prowess. The martial arts of Japan could be studied by certain westerners because as a nation the Japanese had stepped out of the unchanging past and entered the modern flow of history. The Chinese, on the other hand, were still perceived as being somehow eternal and timeless. The inscrutability of an existence without history stoked the flames of fear and placed their martial culture beyond the bounds of rational investigation. The Whang Ho after surviving a typhoon in the pacific. Source: Vintage postcard, wikimedia.